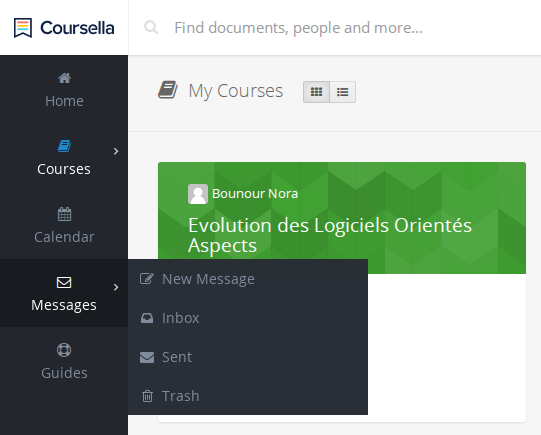 Each member on Coursella has his own messaging Inbox, students and instructors can easily communicate in a secure and private way. You can send a private message to a user or a group of users at once using just their names. He or she will receive the message on Coursella itself. They will also receive an email notification about the message and its content. They can directly reply back from their email's inbox, and you'll receive their response in your Coursella's inbox. You can send a message on Coursella by clicking on "Messages" on the left side menu, then on "New Message" button. You can, as well, attach files to the message by clicking on the button with the paperclip icon next to the "Send" button. Once done composing the message, click on the "Send" button to send the message to its recipient(s). Similarly you can view received messages by clicking on "Messages" on the left side menu, then on the "Inbox" item (for viewing messages sent to you) or on the "Sent" item (for the messages sent by you). You can also check the "Trash" item for deleted messages. Once you have selected an item, you can browse messages, read their content, reply back or compose a new message right away. When you're done composing, click on "Send message".